Metal X. It sounds like the name of everyone's favorite X-Men character, but it's actually the latest in a string of 3D printers debuted by carbon fiber pioneer Markforged. At CES 2017, the start-up most known for introducing carbon fiber reinforcement to the 3D printing industry broke new ground once again with a 3D printer capable of 3D printing metal parts at a low cost.ENGINEERING.com spoke with Greg Mark, CEO of Markforged to learn more. Mark explained that the Metal X 3D prints with a process similar to atomic diffusion bonding, resulting in what Markforged refers to as atomic diffusion additive manufacturing (ADAM). ADAM involves 3D printing with bound-powder rods, in which metal powder is contained within a plastic binder. A cartridge of these rods feeds the material to the printer, which prints the object layer by layer, melting the plastic and fusing it to the preceding layer. Once the process is complete, the part can be placed in a traditional sintering furnace, which burns away the plastic and brings the metal to within 85 percent of its melting temperature. The metal fuses together, the component shrinks by about 20 percent, as is expected, and what's left is a nearly fully dense metal part. This is unlike powder bed fusion processes that fuse metal powders with a high powered laser or electron beam. The metal powders are often volatile and must be handled in a specialty vacuum chamber. Not only is the material used with the Mark X meant to be safe to handle, but the ADAM process offers design and production advantages that powder bed processes don’t have. Due to the nature of powder bed processes, it's difficult to engineer completely sealed hollow parts. The powder needs an exit point (a hole) so that, once the print is complete, the powder is not trapped within the printed component. Because the ADAM process uses a binder that can be burned away, it's possible to print closed objects with complex internal geometries, such as hexagon infill patterns, which can significantly lighten the weight of a part while maintaining structural integrity. It's also possible to 3D print moving assemblies. In this way, the Metal X is not unlike XJet'sNanoParticle Jetting (NPJ) system, which was unveiled in 2016. NPJ also involves a binder that is burned away during the sintering process. Parts printed with the Metal X can be post-processed the way any traditional metal part can, once it has been sintered. Mark explained that parts can be post-processed, due to the softness of the binder, they can even be lightly wetsanded before sintering and, once they come out of the oven, they will maintain a smooth finish. The Metal X 3D printer is described by Markforged as the first metal 3D printer priced under $100,000. This may be true, as most metal 3D printers are well above that price point. The layer resolution of the system, 50 microns, is comparable to most powder bed fusion metal 3D printers. 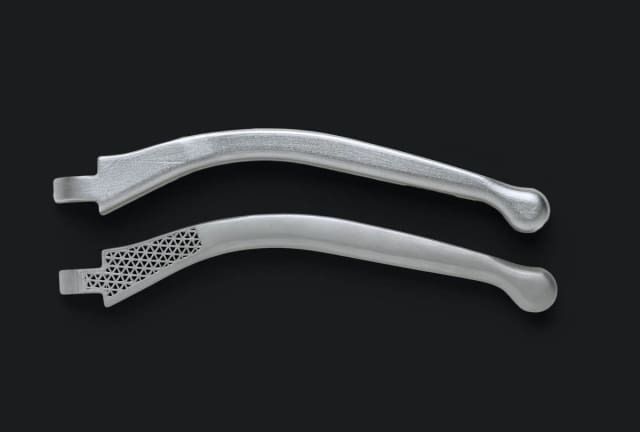 Parts are between 95 and 99 percent dense, depending on the furnace used to sinter the parts, making it competitive with direct metal laser sintering systems. According to Mark, the system is already capable of 3D printing with 17-4 and 303 stainless steel. The company has stated that other metals are already under development, including A-2, D-2 and M-2 tooling steel for injection molding, as well as 6061 and 7075 Aluminum and 6AL 4V Titanium. The Metal X has a similar frame to the machine's carbon fiber printing predecessor, the $69,000 Mark X industrial carbon fiber 3D printer. It has a substantial build volume of 250mm x 220mm x 200mm (9.8 in x 8.7 in x 7.9 in), includes a built-in camera and runs on the Markforged cloud-based Eiger software platform. The Metal X also features the same in-process quality control that was introduced with the Mark X. This quality control system is a unique one, and uses a laser to inspect parts for dimensional accuracy during the printing process or once a print is complete. Shipping for the new system begins in September with the aforementioned stainless steel capabilities, but Mark said that other materials would likely be made available pretty shortly after that. The price of the Metal X starts at $99,500, which does not include the necessary furnace, but, according to Mark, many of the firm’s clients likely already have one. Interestingly, all of the Markforged systems are available as upgradable packages. While the Onyx One, capable of 3D printing chopped carbon fiber filament, is available for $3,499, it can be upgraded to 3D print with fiberglass reinforcement for another $3,499. It can be further upgraded to the Mark Two or Mark X to print with continuous carbon fiber. And, if you've fallen in love with all of the above and have the dough, it's possible to purchase the Mark X and Metal X in a bundle $149,000. 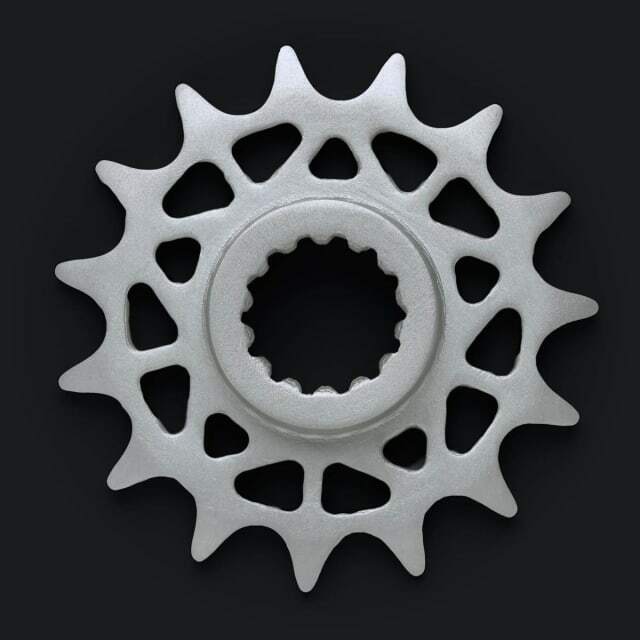 To learn more about the Metal X, visit the Markforged website.